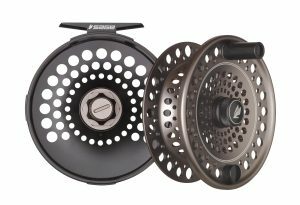 The new SPEY reel series from Sage combines classic design elements with modern performance features. BAINBRIDGE ISLAND, Wash. (July 11, 2018) – Sage has a long, storied history of manufacturing reels, so for its new SPEY reel family, it called upon classic designs and combined it with modern performance features to ensure you don’t lose the fish of a lifetime. Sage’s SPEY reels are heavier with minimal porting to balance longer rods and has an increased capacity to accommodate larger lines thanks to the concave large arbor. It also features full line guards to assure thin running lines do not migrate between the spool and frame during dynamic casting motions. Each model features Sage’s Sealed Carbon System (SCS) drag with a machined and anodized One Revolution Drag Knob with numbered and detented settings. The SPEY comes in 6/7/8 ad 7/8/9 sizes and retails for $475 and $500, respectively. With bronze or stealth/silver color options, it arrives with a neoprene and embroidered nylon reel case. Extra spools are available for $237 and $250, respective to the model size. Founded in 1980, Sage was created with one idea in mind—to build the world’s finest performance fly rods. From the start, Sage has maintained that singular focus on delivering the finest performance fly fishing rods, reels, and equipment to the avid angler. We are a company of passionate anglers and craftsmen, continually seeking performance advantages through new materials, designs, and engagement with the fly fishing community. We fly fish. You can feel our passion for fly fishing in everything we do. For more information, please visit www.sageflyfish.com, Facebook, Instagram, Vimeo.